A guided challenging climb to the top of the most active volcano “ Merapi “ that lays around 40 km away from the city of Solo is organized merely for you who'd like to experience a real sensational adventure. “ join this tour and catch up with the other adventurer “. 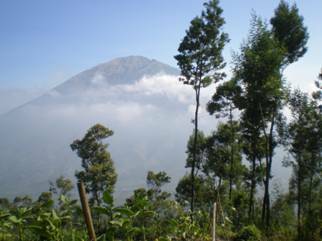 Ø 12.00 pm : after having a cup of coffee, the local guide would take you climb to the top of merapi Volcano. Ø 05.00 am next day : waiting for the sunrise at the peak of Merapi. Ø 06.30 am : walk down to the transit place. Ø 09.00 am : have a small traditional breakfast at the transit place, then we would take you back to the hotel at Solo.